Sometimes a card just designs itself – today is one of those! I started by stamping the images on a long scrap of paper, just to see which of the Flora and Fauna critters works best as a mermaid, and which prefer to be unicorns. And when I saw them all lined up in a row – I thought, AHA! A slumber party! Yep, I went there! Watch the video below or click HERE to see it in HD on YouTube. So am I crazy for coming up with an idea like this? No don’t answer. Let me live in my own little artsy world! Teehee!! What an imagination! I love the idea of those animals having a slumber party. Great job showing the how of the sliding window too. I’m going to check my stamps and see what I have that could work similarly. Darling … I can’t imagine any recipient that wouldn’t get a giggle from this card. Oh Sandy, this is such a cute card! Your imagination is AWSOME !!!! Sandy, you are so neat! Creativity is your game and you play it so well. I don’t know how long the video was, but for that length of time I was lost in your world. What first drew my eye was the lime green color in contrast with the black – that buzz was enough to get me looking at my own stash to get some of my own creativity flowing. Your comfortable ease and humorous vulnerability made your video not only inspiring, but endearing and sweet…thank you for sharing! No, you’re not crazy! Just fun! Critter mermaids may not be my thing, but so many great techniques. Even watching you draw and color inspires me to be brave with a black marker! Always appreciate your artistry and light . Happy Easter. I LOVE this and it is extremely creative! Okay – this is darn cute! I love it! Oh wow, that stamp set is just adorable!! 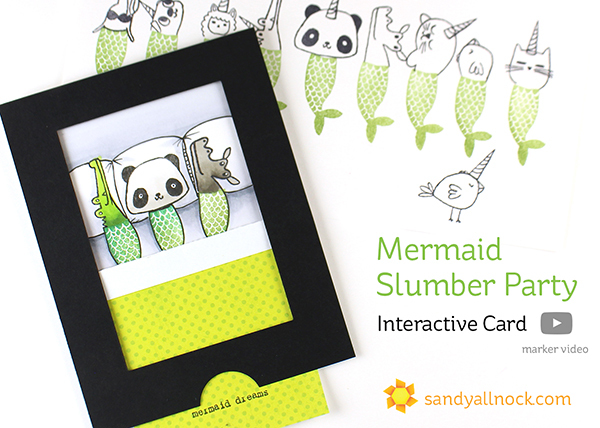 And I love the slumber party idea – so cute and creative!!! Super cute!!! Happy Belated Birthday!! So stinking cute Sandy and crazy??? No way, just a lot of fantasy and that’s great! Thanks for an other awesome card. So, so cool Sandy. I love an interactive card and this is a cool interactive card. What a crazy thing to do with the critters but it works! Thank you for sharing this with us crafters. Wow.! Only Sandy could be that creative. What it just be like to live in your brain. Love it! This is just so creative – what a great idea! Cracks me up! LOL, that is adorable! Who would have thought of that aside from you? You are truly an original! I love it! Hahaaa – nobody can say your cards aren’t original, that’s for sure! Funny idea – and a thumbs-up to Flora and Fauna for coming up with such a wacky stamp set! We see so many new stamps released every month – it’s refreshing to see something really different! Great idea to tuck them into bed for a sleepover. Thanks!